"It is a dark time for the Rebellion. Although the Death Star has been destroyed, Imperial troops have driven the Rebel forces from their hidden base and pursued them across the galaxy......"
Wait, wrong blog. This is the Bama Hoops blog. Basketball, not The Empire Strikes Back. Different topics. Well, maybe not so different. The Alabama fanbase is uncertain about the future, looking at perhaps a game of impossible odds on Saturday. A&M is Darth Vader: A top five team that looks like the best team in an improved SEC conference that may be unstoppable. Alabama is Luke Skywalker: Young, reckless, perhaps ready to lose their hand (metaphorically) on Saturday, and have it revealed that A&M is their daddy. No? That's just me? Okay, okay. We'll do a normal preview. I hope everyone had a nice holiday. 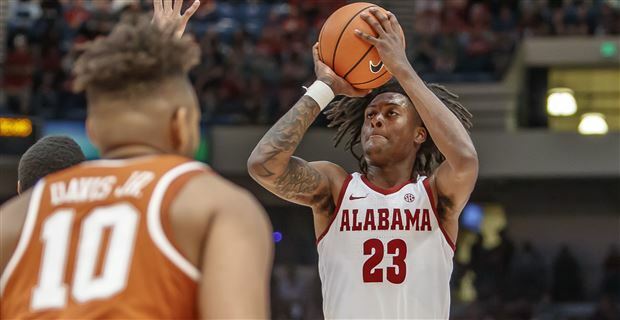 Conference play begins this Saturday when Alabama, fresh off a humbling loss to the Texas Longhorns, will host Texas A&M, currently ranked fifth in the newest AP poll. Alabama is 5-9 vs ranked teams during Avery's tenure (actually a really good record for a rebuilding program, particularly when you consider the lack of wins vs ranked opponents during Anthony Grant's six seasons - a dismal 3-28) The program has yet to play a team ranked in the top five during Avery's tenure (Kentucky has been ranked outside the top five when Avery's teams have faced them the past two seasons). Game time is 5 P.M. CT. Alabama will get another shot on national television on ESPN2. Click the links for team and KenPom stats. My Two Cents: A&M will be without two starters for this game. Admon Gilder is out with a knee injury, while D.J. Hogg, the team's leading scorer, will be serving the second of a three game suspension. Despite the absence of those two players, this Texas A&M team is a deep and talented one that is more than capable of coming in and adding to Alabama's recent misery. Frankly, this game isn't so much about A&M to me as it's about this Alabama team. They've lost four of their last seven games, and it could have been worse when you factor in how many close wins they've had. Even in those wins, the team has struggled to consistently defend or run competent offense for 40 minutes. They've been able to gut out eight wins, some of them against quality competition such as UT-Arlington, BYU, Rhode Island and Mercer (currently all ranked in KenPom's top 100), but they're winless so far in match-ups vs Power 5 opponents. It's not a postseason resume relegated to the dustbin, but it's not exactly going to light up the committee room if the tournament was selected today. If this team is going to meet its postseason goals, it must do some work in conference play. For a pleasant change, the league will offer many opportunities this season: all fourteen programs are currently ranked in KenPom's top 100, while eleven programs are currently ranked in the RPI top 100. We have been writing in recent weeks about the lack of a steady rotation and chemistry, and how that has hurt this team. In addition: poor shooting, a clear lack of floor leadership, and the uncertainty that comes with relying on so many young players (eight of the eleven available scholarship players are freshmen and sophomores) has also contributed to the struggles. What kind of competitive edge or leadership does this team have, or is capable of having? This game will go a long way towards answering that question. In many ways, this game represents a crossroads of sorts for this Bama team. Win or lose Saturday, the coaches have got to figure the roster out, put together a rotation, and hope that group of players can gel throughout the rigors of a conference schedule. There's a lot of basketball left to be played, but for the first time there is doubt among a growing number of fans and media about the long-term prospects of this team. Some faith needs to be restored. A win over a top five team would be a huge step in restoring some of that faith. Players to Watch: Collin Sexton was in obvious pain down the stretch of the Texas game. Afterwards, Avery mentioned Collin was dealing with a groin injury, and cramps were also a problem for him late in that game. Collin did not have a great game vs Texas, but there's no questioning his talent or his competitive edge. This team needs him on the floor. The hope is a week off gives Collin the rest he needs to be close to 100% for this game. I will also continue to mention Braxton Key in this space because his struggles since his return two games ago has been tough to watch. Did he come back too soon? Is it just rust? Should Avery bring him off the bench until he regains the form of his freshman season? I do agree that Braxton should play if he's been cleared to play. I also believe Avery should have brought him back slowly; starting him immediately was probably not the best thing for Braxton or the team. Not only due to Braxton's physical state, but he had virtually no game experience with the newcomers. It's also worth noting that Riley Norris has not looked 100% since he returned from his hip injury. It doesn't excuse all of the struggles of this team, but the fact that Braxton and Riley were injured before the season, and have struggled to return to form, is a major storyline of this season so far. The bigs for Texas were a major part of the Longhorns demolition of Alabama last Friday. And the Aggies will also bring a dynamic duo of big men to Tuscaloosa on Saturday. Robert Williams (6'10, 241 lbs) was a possible lottery pick last season if he had declared for the NBA draft, but he decided to return to school. He's a player, like Mo Bamba, that can affect a game without scoring a bucket. He leads this Aggies team in rebounds (10.1) and blocks (2.6), despite missing four of the Aggies twelve games so far this season. Tyler Davis (6'10, 266 lbs) doesn't play above the rim like Williams can, but he's a load in the middle. His numbers so far are impressive: 13.9 ppg, 8.4 rpg, 1.8 apg, 1.5 bpg. Assuming the A&M coaches have watched film of the Texas game, expect a healthy dose of Davis and Williams early on Saturday.